While summer will always be my favorite season, I love the holidays and all the preparation that goes into this busy time of year. Thanksgiving is already less than one week away and then from there on out, Christmas will be here before we know it. One way I love to celebrate the holidays is through my baking for family and friends. It's time to start sifting through all of my cookbooks, magazines and pinned recipes to start planning my holiday baking list. Our family has their favorites we make each year, but it's also fun to try new recipes. Once I've got my list all made up, it's time to sit down and write down every single ingredient I will need. Even if I know I have that item on hand, it's good to double check and see if the ingredient is fresh and will last through my baking sessions. I've put together a little guide for you to consider when it's time to start your own holiday baking. These are items that I try to keep on hand not only during this time, but also year round. I also want to note, on many things I'm not particularly partial to brands. You'll find I do use some name brand items but also some generic. Some things might be organic but not always. It might depend on sales and our budget at the time as to whether we buy organic or not. I like to keep a variety of flours on hand at all times. Unbleached all-purpose is always a must, you can use it in just about any recipe. I also like bread, cake and whole wheat pastry flours; these are ones I use the most. Cane, brown and powdered sugar are what you'll find most of the time in my pantry. I do try to use natural sweeteners such as local honey and pure maple syrup as much as I can. I'm becoming more comfortable substituting these in place of sugar, but I also know that some recipes you do just need plain old sugar. Chocolate chips should be going on sale soon, if not already. Now is the time to stock up on a variety of these. Anywhere from dark and semi-sweet to cinnamon chips. I also love to keep almond bark on hand, especially for recipes like this one. Nuts can be expensive, but they certainly can help baked goods to taste so much better. I typically have almonds, pecans, walnuts and even peanuts on hand. Oh, and coconut is a must. If I know I won't be using them all at once, I store the extras in the freezer, coconut stays in the fridge though. This will help to retain the quality and freshness of the nuts. Raisins and cranberries are almost always in my pantry. They are great additions to granola and cookies. You might have some other favorites that you like to keep stocked. Both quick-cooking oats and old fashioned oats are in the pantry at all times as well. Along with peanut butter. Seems like there is always something yummy we can make involving those two ingredients. And butter, you cannot forget the butter! While it's not something stored away in the cupboard, I always aim to have an ample supply of butter. If you find it on sale, grab as many as you can and store the extras in the freezer. It will keep for a long time, if it even lasts that long! Oils are another item to keep on hand. Whether you use vegetable, canola, olive or coconut; many recipes call for some sort of oil to be used. I always replenish my supply of baking soda and powder at this time of year, that way I know it's fresh and will keep my baked goods at top quality. If you're comfortable baking with yeast, you'll want to have a small jar in the fridge or at least a couple packets nearby. Cinnamon rolls are a treat on Christmas morning! Spices should also be checked, make sure you're not baking with two year old cinnamon and nutmeg! 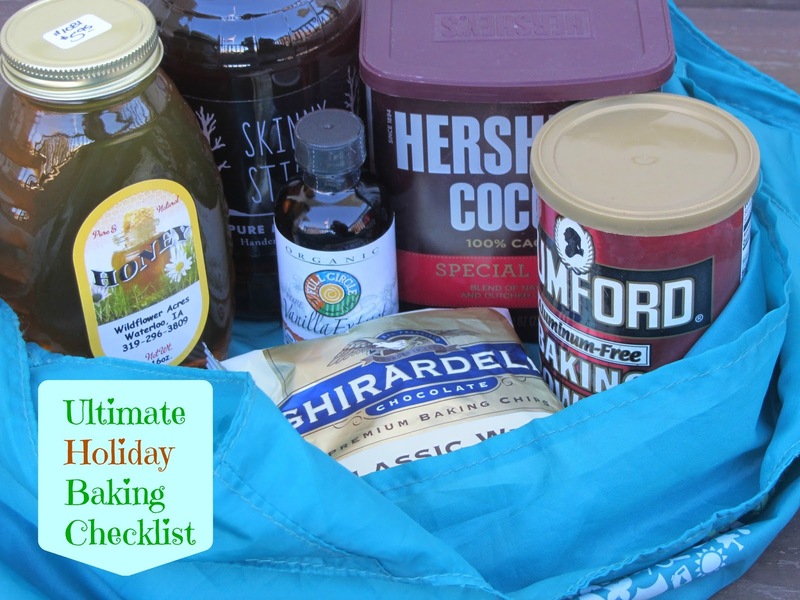 While I'm sure there's an item or two I missed or maybe something you always bake with and I don't; I hope you've got a good idea on how to stock the pantry this holiday season. Take the weekend and leisurely thumb through your family's favorite recipes and make your list. Then go ahead and devise a game plan. Maybe it's preparing a recipe or two each weekend leading up to the holidays. The freezer can be your best friend during this time! I always love freezing cookie dough, cinnamon rolls and unbaked pies. It makes entertaining a breeze or when I need to bring a dessert to a gathering. This allows you more time to focus on your family and friends and that after all, is what is most important!